This year I had to change things up a little. Since we have moved into our house I have put up 2 trees. One upstairs and one down stairs. We bought new furniture for the living room at the beginning of the year, and now wasn’t sure if I was going to have space to fit the tree downstairs. Jeremy said I didn’t have to put it up, but I told him I was finding a way lol. Just wouldn’t feel like Christmas without seeing the tree in the living room. 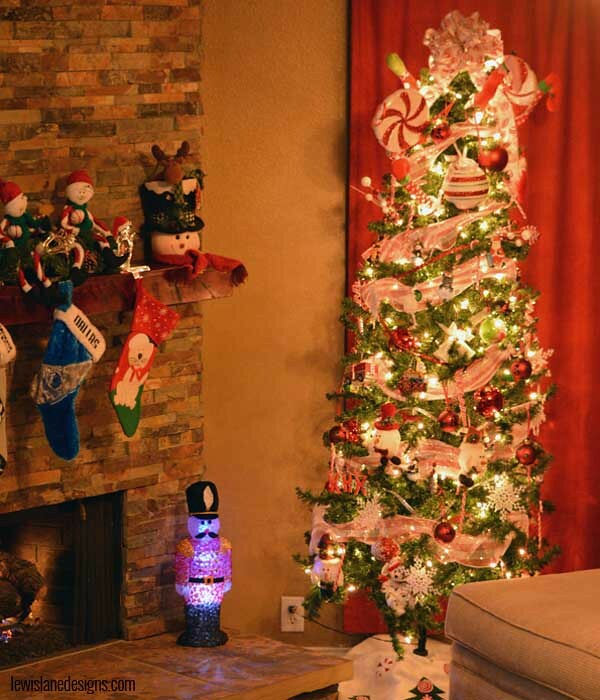 I was able to fit the tree in downstairs by using a taller skinnier tree. Like to think of this tree as my memory tree. Most of the ornaments on it have some kind of special meaning to me. Wedding bells to represent the year Jeremy and I got married. Last year I made sure to buy Arya her ornament, and I still have Rider’s ornament on the tree. We have started a tradition of buying ornaments when we travel. Have a set of fireman snowmen that my Aunt made me. The one upstairs is my sports tree since I love sports. This tree I have been putting up since I started putting up my own tree. It represents all my favorite sports teams. Last year I even finally broke down and made my own tree skirt. 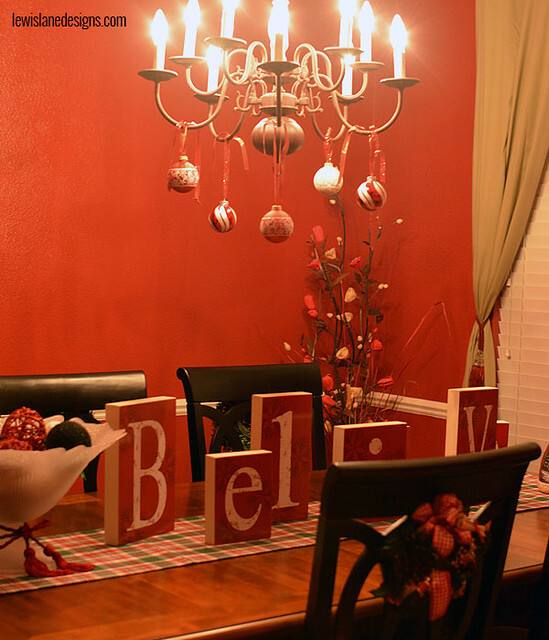 Last year I got this idea on how to decorate my dining room from Pinterest. Think it turned out pretty cool looking. Got a lot of stuff to do to get ready for Christmas tomorrow, so this is probably my last post before Christmas. With that being said. Just want to wish you and your family a Merry Christmas! Hope you get to enjoy some good food, and make some great memories with your family! Have been putting up a Sports Themed Christmas Tree for years. 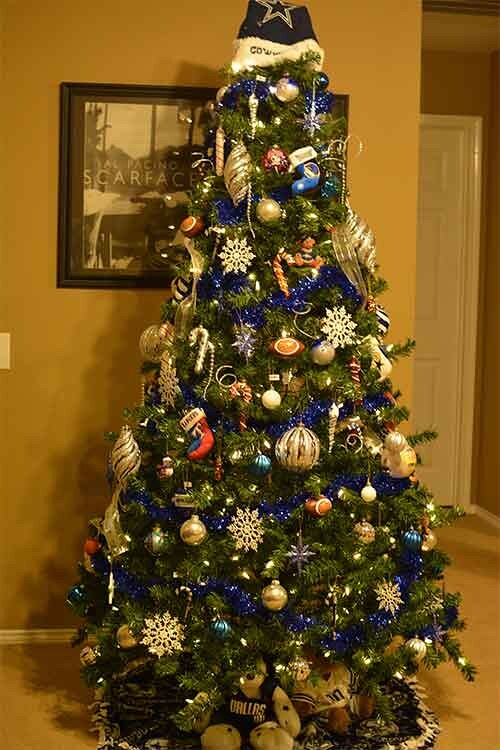 All my favorite teams are represented on the tree (Dallas Stars, Dallas Mavericks, Texas Rangers, Dallas Cowboys, and Texas Longhorns). 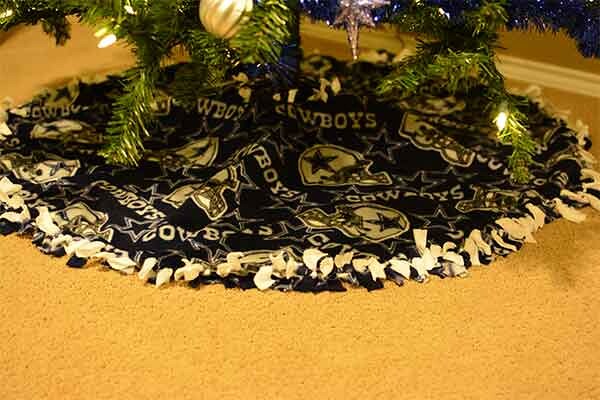 The one thing I have had a hard time finding was a tree skirt for one of the teams. Every year I look and they are either super expensive or sold out. When I told Jeremy I was having trouble finding one he suggested making one myself. Not sure why I hadn’t thought of that before. Have made several no sew blankets, and figured I could use the same concept to make a tree skirt. Ended up making my own DIY Christmas Tree Skirt with no sewing required (that is a good thing since I am not really good at sewing). Now my first attempt I messed up on, but I decided to give it another shot. The second attempt turned out better. Put your 2 pieces of fabric on top of each other. Fold the fleece in half, and cut two half moons in the fabric. A large one, and a small one. 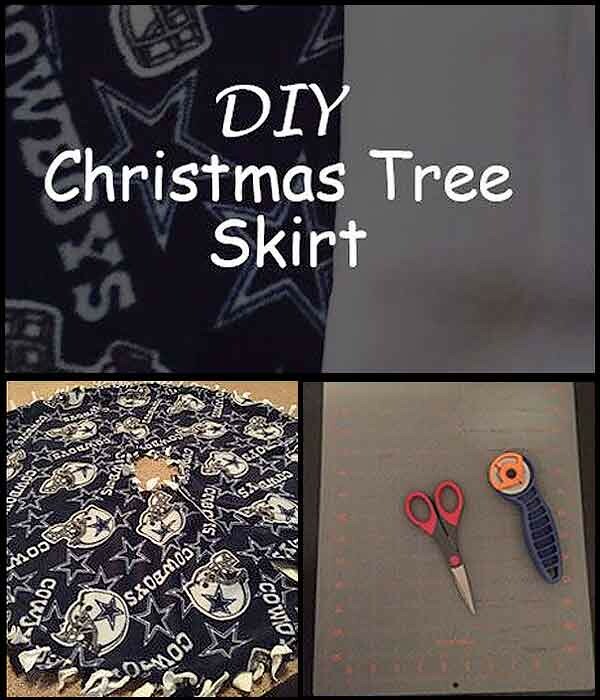 To do this I used my old tree skirt as a patten, and cut around it with scissors. Cut the fringe – Cut 1″ sections all the way around going 2″ from the edge. What has worked best for me is using a cutting mat. Makes it easy to see the measurements so you can cut 1″ over and 2″ up. Tying knots – Tie each section in a knot just like you would your shoes or a balloon. Velcro – On the slit play Velcro up at the top and down at the bottom on each side of the slit. This way you can fasten the skirt once wrapped around the tree . I did end up also putting Velcro between the two pieces of fabric to keep it together. This is the final product! 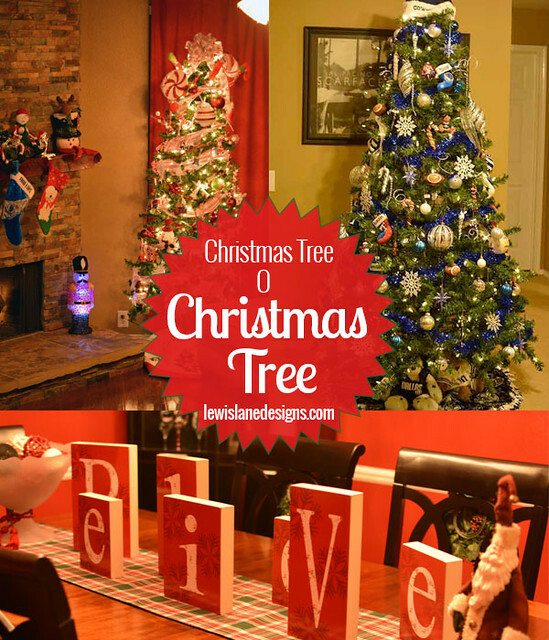 What is your favorite thing about decorating for christmas? Now this post might have looked familiar if you have been following me for a while. This was a post I did last year before I lost all my post, so wanted to repost & freshen it up a little. Hope you stop back by tomorrow cause I am going to show you can go find old post if you lose them. 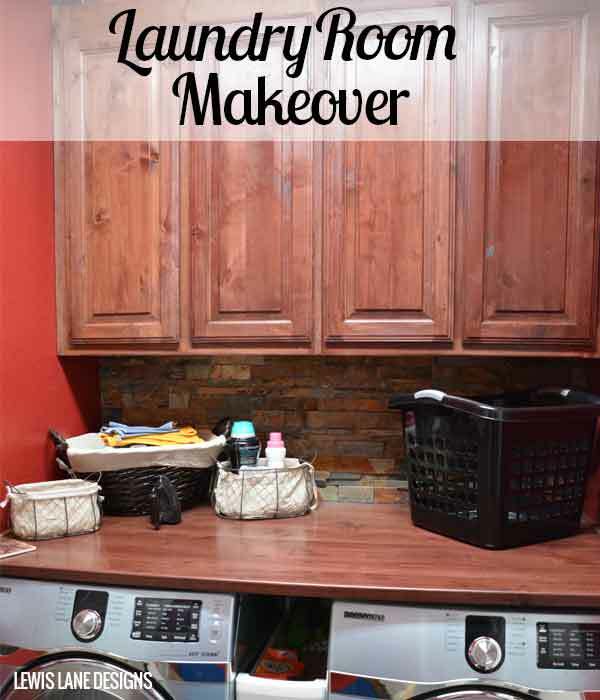 Very excited to be getting to finally share my laundry room makeover. It has been done for a while now just lots of things have kept me from getting to write this post till now. 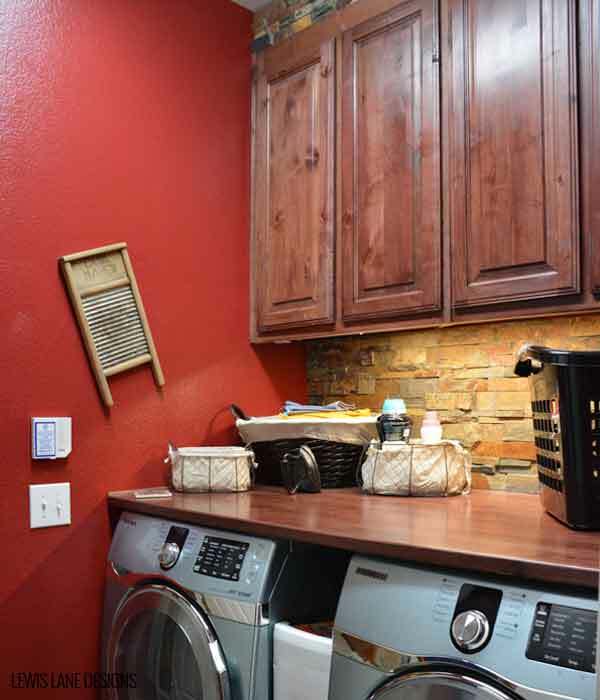 Really love the way the laundry room makeover turned out, so wanted to share. 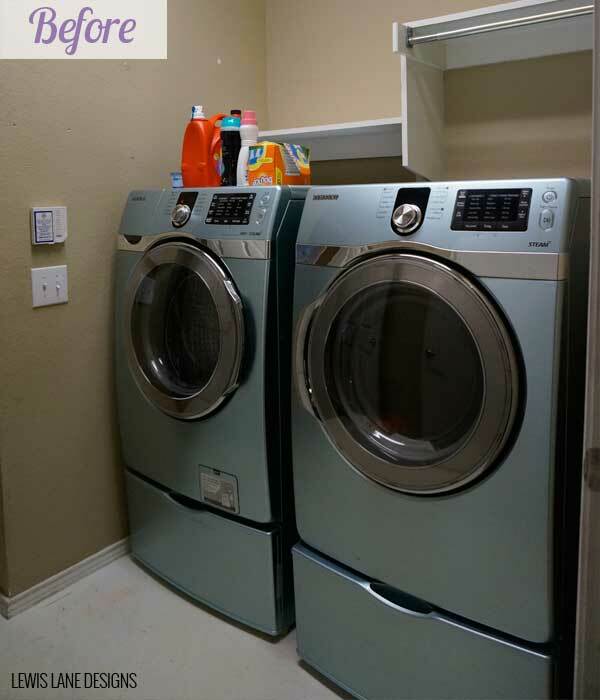 Pinterest is where we got our inspiration for the laundry room makeover as well as inspiration for other makeovers we have done at the house. 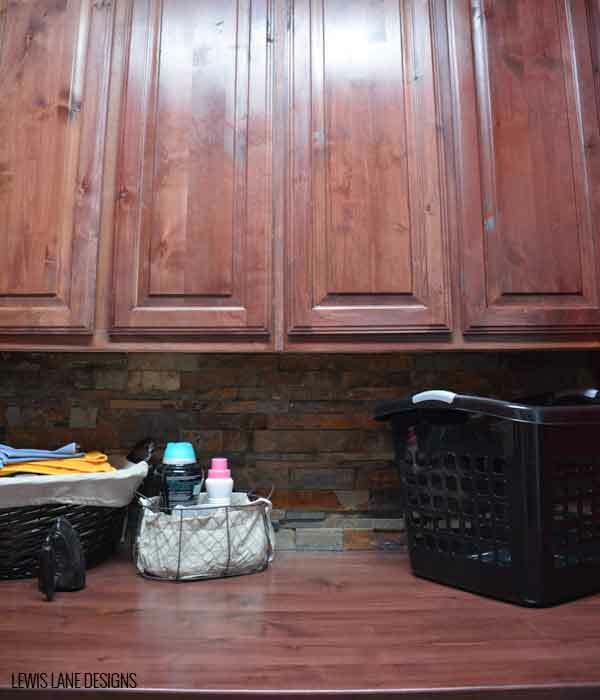 This laundry room makeover took us quite a while to complete. 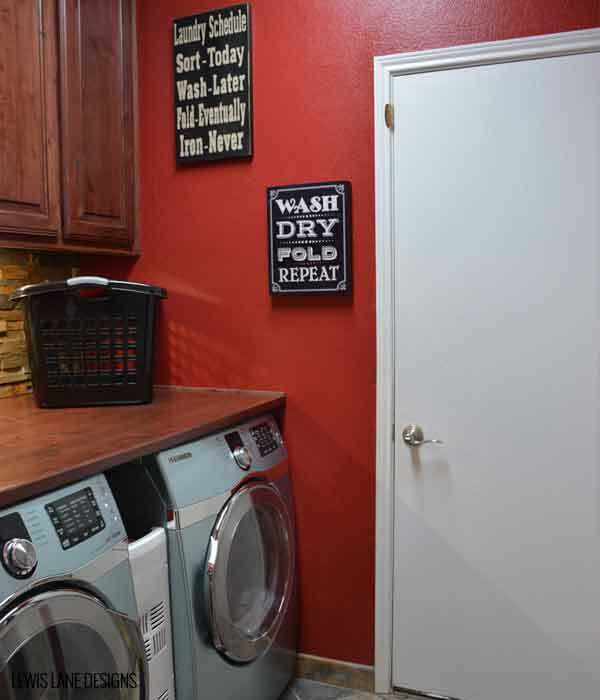 We started by giving the walls some color taking them from a tan color to red (Ralph Lauren-Maleya Red at Home Depot). We picked this color cause in the pin we liked the room was red, and if you follow me on Instagram you will notice this is same color as my dining room. Since we were in the painting mood we also freshened up the doors by giving them a fresh coat of white paint. My favorite part was getting rid of the dingy looking white linoleum, and replacing it with tile. You can see in the before pic we had just a shelf, and we replaced it with cabinets instead. The cabinets along with board you see across the top of washer and dryer we had custom made by a local company.This was the part that took a few months cause we had to wait to get the cabinets in, and then stained them. For the back splash we used leftover stone we had bought at Home Depot when we had our fireplace stoned a few years ago. The coloring we thought went well with the red, and dark cabinets. The baskets you see just happened to have had lying around the house, and the iron you see sitting by the baskets we got from a antique shop. The pictures on the wall we found at Hobby Lobby. 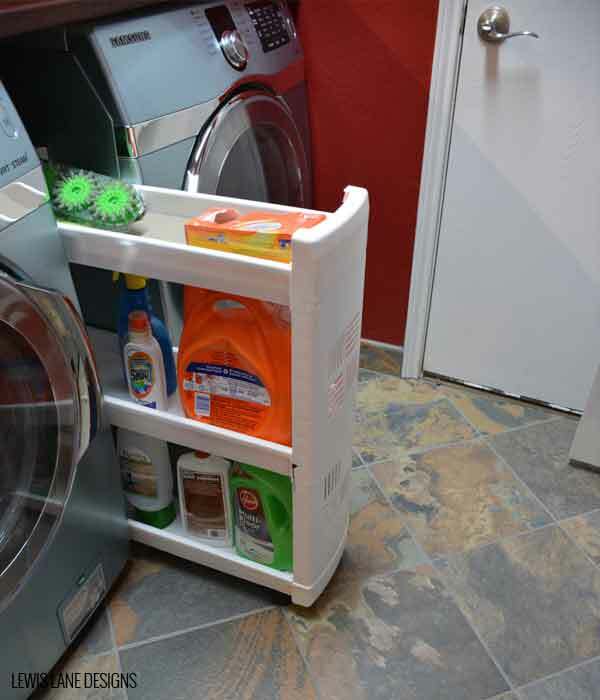 Got the pull out organizer from Home Depot cause I am short, and no way was it going to work pulling detergent out of the cabinets all the time. This took a while, but the outcome was so worth it. 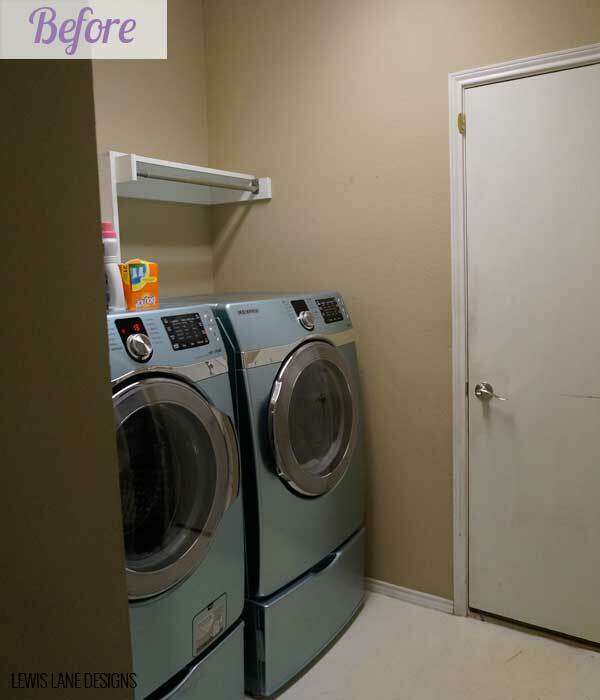 Have to say I am extremely happy with how the laundry room turned out. Now loving how it turned out has not made me want to do laundry, but makes it easier lol. Here are some other makeovers we have done to our house in case you are looking for ideas. We are actually in the middle of a huge project at the house of making over the patio. Will be sharing as soon as it is done, but you can follow me on Instagram if you would like to see the progress I will be using #lewislanehometour. What part of your house would you like to give a makeover? 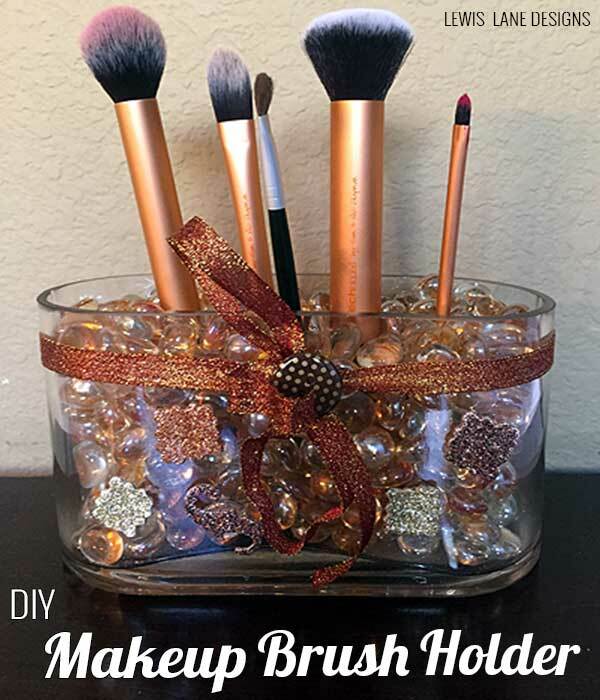 A while back on Instagram I shared a pic of an extremely easy DIY makeup brush holder that I made to display my makeup brushes. 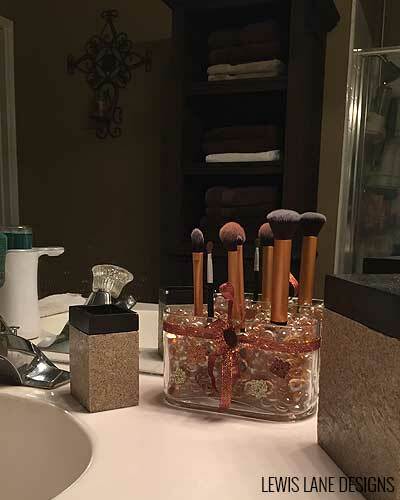 My mom had actually seen a DIY Makeup Brush Holder on Pinterest, and made one herself. The makeup brush holder mom made turned out super cute, and she told me it was very easy to make. After I bought a new set of makeup brushes I really wanted a makeup brush holder like mom’s to put them in, so figured I would try to make one myself. Thought it would be a fun and functional decorative piece I could add to my bathroom. Any other embellishments you would like to use. Just simply pour the marbles in the vase, and then decorate it however your want. For mine I chose to use mini marbles instead of the bigger ones. No rhyme or reason to using the mini marbles just was a personal preference. Not only was it easy to make, but even better the materials were inexpensive. Bought the marbles and vase at Michaels. Michaels even had an information sheet on how to make a DIY Makeup Brush Holders. The cashier at Michaels was nice enough to let me use 2 of my 40% off coupons, so only cost me $9 for the vase & marbles. Michaels even takes Hobby Lobby’s 40% off coupons, so don’t forget to take your coupons if you want to save some money. Then I happened to already have some ribbon and cutouts in my craft room that I used to decorate the vase. 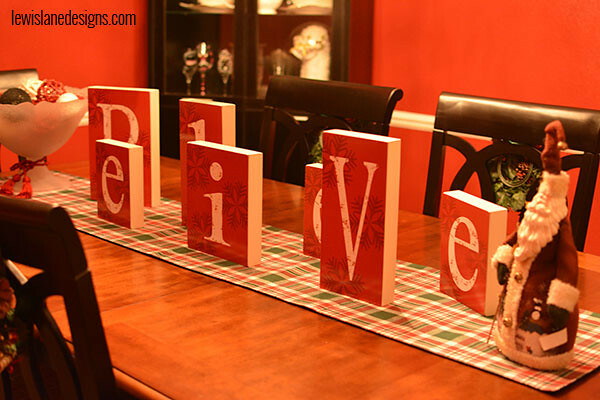 Love the fact it is so easy to make, and customizable to fit any decor. What DIY project have you tried lately or found on Pinterest that you want to try? Summertime means Wedding Season. Your wedding is an important day, and it can be a very expensive day. Many brides fall into the trap of spending a ton of money for their wedding cause they want it to be beautiful & perfect. Totally understandable, but you do not have to just go spending crazy for it to be beautiful. You can find many tips and tricks to save money. Trust me every little bit will help because things will add up quick. Plus if you are like me, and a bargain shopper you don’t like paying full price. Nothing puts me in a good mood like a good deal. Here are some ways to save on your wedding day. Setting a budget, and sticking to it is hugely important. Probably the easiest would be to first come up with an amount you want to spend on the entire wedding. Then list out everything you will be needing to spend money on. 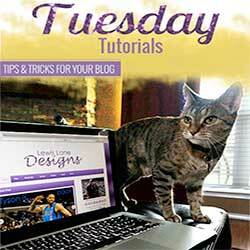 Make sure your list is easily editable, because you will be editing it a lot. Once you have the list look it over and determine the things that are most important to you, and allocate money for those. Then look at how much you have left, and allocate it to remaining items on the list. This will give you idea on how much you can spend on everything, and where you can save money. Probably a good idea to keep this list in your phone so you can easily adjust the budget as you setup things. There are tons of things that will come up, and this will help you make sure you don’t go over your budget. Plus will help you keep track of what is paid, and what you still have left to buy. Of course they even make apps for this to help you out like this Wedding Planner App. Micheal’s, Hobby Lobby, and eBay are some great places to find things that are cheap, and will help you stay on budget. Best part is you can usually find a 50% coupon to Micheal’s or a 40% off coupon to Hobby Lobby. I know I was constantly going to Micheal’s and Hobby Lobby to pick up something, or picking up little things here and there off eBay. Loved that on eBay I found some firemen wedding items like my guarder that said “Today I Marry the Bravest Firefighter”, and our toasting glasses. Fell in love with the toasting glass cause it said Groom and had a fire helmet. Fun way to save money on the wedding is have fun doing some DIY projects. Save some money on the reception by getting some friends together and making centerpieces. Just buy some wine, and you will have no problem finding someone to help. Pinterest has a whole section dedicated to weddings with some great ideas on DIY projects, and ways to save money on your wedding. To me this is a Win Win because not only do you save money but can make some great memories with family and friends. You will remember that more than just going out, and buying it. For my wedding I made my own invitations. To do that I bought the invitation card stock at Micheal’s with my 50% off coupon (They run those coupons all the time, so you should have no problem finding one). The invitations included a template to design the invitation. After I got it the way I wanted it I saved it on my thumb drive, and took to Kinko’s to have it printed. All in all it cost me around $50. Lot cheaper than I could have had them done for. Also bought some velum & ribbon that I added to the invitations myself. DIY projects are probably the easiest way you can save some money. Another project I did was made flip flops for my bridesmaids, and myself to wear. Biggest way to save money is to set limits on the guest list. If you don’t you will spend a ton of money. One of the biggest expenses for the wedding is the cost of the food. If you do a sit down dinner you pay per plate. The more people you have to accommodate the bigger the place you need and the more money you will have to spend. Keeping the guest list small can be a very hard task, because you don’t want to hurt anyone’s feelings. Jeremy thought we would have a small guest list since we just invited close friends and family. He was shocked when we started making the list and it ended up being 150. That is what happens when you get married close to where you live, and have a big family (If you have a big family might want to consider destination wedding cause could save some money. Just saying lol). You will be amazed how big the list gets when you start writing down people along with there spouses, and children. The guest list can seriously get out of control. The place we got married at you bought a package and your price depended on the amount of people you had. If you went over the amount to the next package size you had to pay extra, so you had to make sure to stick with the number you had told them. We just had to say ok this is our limit, and no more people. Setting a limit to your guest list will help you keep within your budget, and save you from having to pay extra fees. Most of the time you probably have people you know that can help with someone things. Like maybe someone in the family is a florist, or a photographer. Ask them if they would mind helping you out and do the flowers or take the pictures. This would help you cut cost on those things. My photographer was actually a guy I worked with that does photography. He did all our wedding, and engagement photos. You can save money on the invitations/save the dates if you want by just doing electronic invitations/save the dates. Doing it this way the invitations/save the dates would not cost you a thing. Even will help you track RSVPs. Evite is a great site to use. Something free you can do is create a website on The Knot (Site I did for my wedding). You could use this just to share wedding info with any friends and family that would be interested, and it allows people to RSVP. This is how I let people know our venue had to be moved when the place I had booked decided to close 1 month prior to wedding (Yes the invites had already gone out). You can find tons of discounts on wedding things online. Found the bridesmaid dresses online from David’s Bridal. They were ones they had online only, and were on sale. You can find tons of other ways to save on your wedding day. 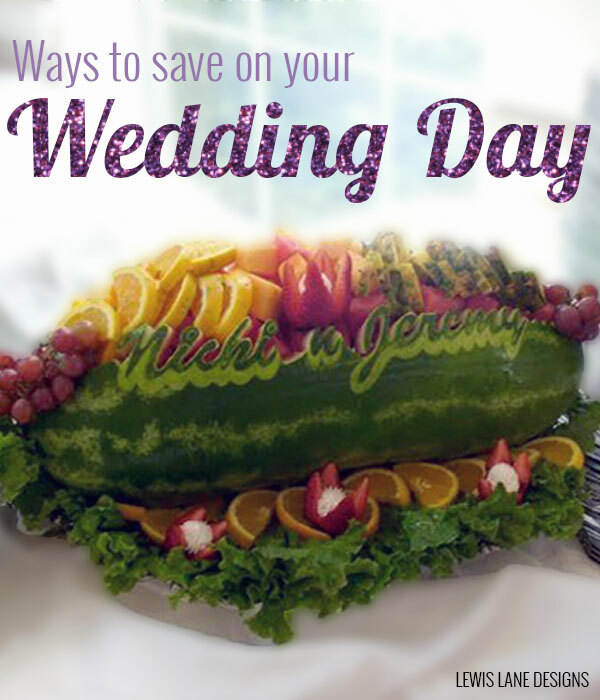 Hopefully you found these ways to save on your wedding day helpful. The biggest thing is just be happy, and enjoy your wedding. 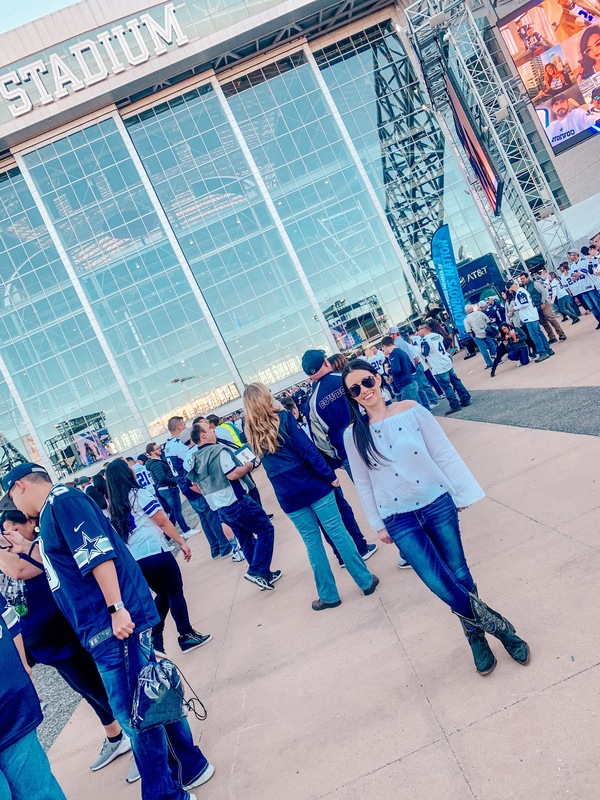 You spend all this time planning, getting ready, and then it is over in an instant. Just make sure to take the time to sit back, and enjoy. Don’t waste time stressing about all the details, cause most likely something will go wrong (like you venue cancelling that I mentioned earlier). Have yet to hear of a wedding where everything went perfect. Most of the time some little thing goes wrong, but usually it works out. As long as you focus on the fact that you are marrying the LOVE of your life you will have a wonderful wedding day. What other saving tips would you share with a future bride, or something you wish you had known? When I got married nearly six years ago my Aunt made a DIY Wedding Day Survival Kit for me that she gave me at my wedding shower. This was one of most unique and useful wedding gifts I got. Loved this idea so much I ended up making some for friends, cause I thought it was just such a great gift. With summer being wedding season thought I would share this in case you have a wedding to go to. It is a kit of the little things you might forget for the wedding day. The bride will have so many things on her mind the day of the wedding, and will probably forget some of these little things. 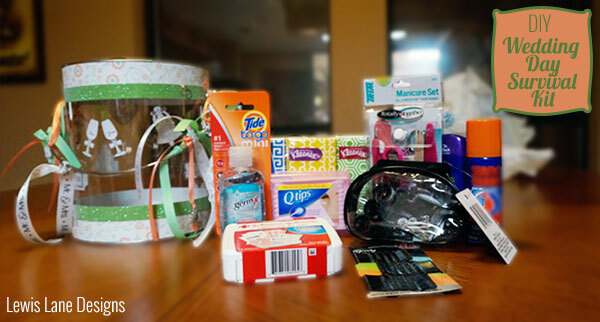 Giving her this kit will help her not have to worry about remembering some of these little things, and will help the wedding day go smoother. This is really easy and fun to make. Before you start making this you will want to find out what the wedding colors are. Add anything else you think a bride might find useful. 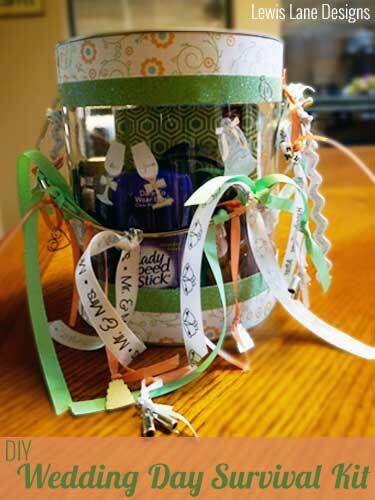 You just simply wrap the container with the scrapbook paper, add stickers as you like, put ribbon strips with embellishments on the handle, and then put all the items in the container. Would you have found this helpful on your wedding day? 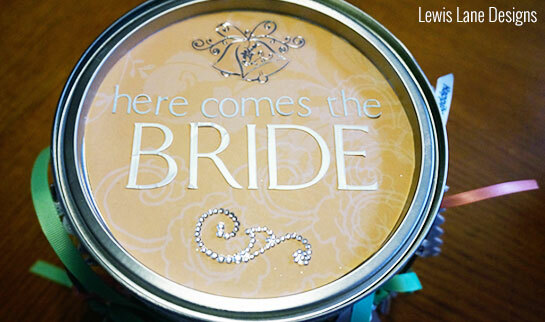 What other things do you think would be useful for a bride on her wedding day?